RWPsychology is a psychology practice based in Milperra NSW who specialise in psychological treatment and counseling for children, adolescents and adults. Practice manager Renata recently contacted OnePoint seeking professional help to relaunch their website. 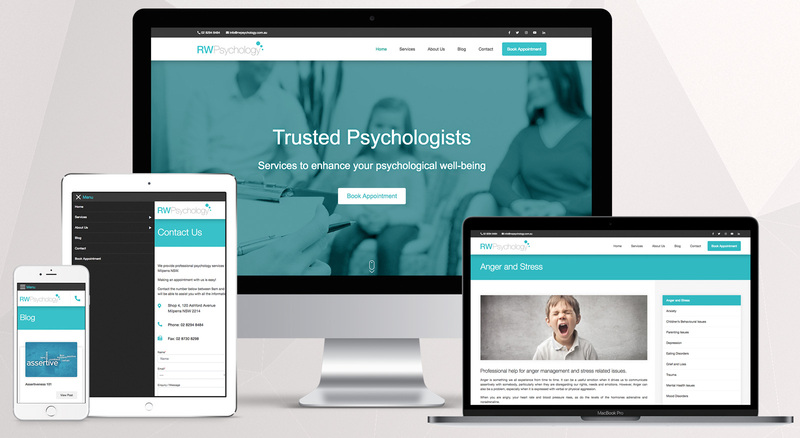 Originally setup with Vistaprint’s DIY website builder, RWPsychology has since grown into one of the leading psychology practices in western Sydney and a professional website was needed. Our team worked closely with Renata to create a modern website that effectively showcases the services provided. The custom theme features a Bootstrap 4 skeleton framework to ensure seamless responsive design for all screen sizes. WordPress was the CMS of choice for the project and a custom theme was developed to allow Renata and the team full control over the website. The website features dedicated staff and services sections, Power Diary booking integration, Zendesk live chat, contact forms with anti-spam, slideshow and search engine optimisation tools. Web hosting was also required and thanks to our affordable CPanel hosting, the new website is now hosted in a fast, and reliable Australian data centre. Need to speak to a OnePoint team member about professional web design? Contact us on 07 3444 0045 or request a free quote online.